I’ll let you in on one of our trade secrets. At Ceralytics, we have four distinct buyer personas. We created them in the early days of our company and used them to build out our product and develop our market strategy. We updated them over time as we learned more about our audience’s needs and pain points. 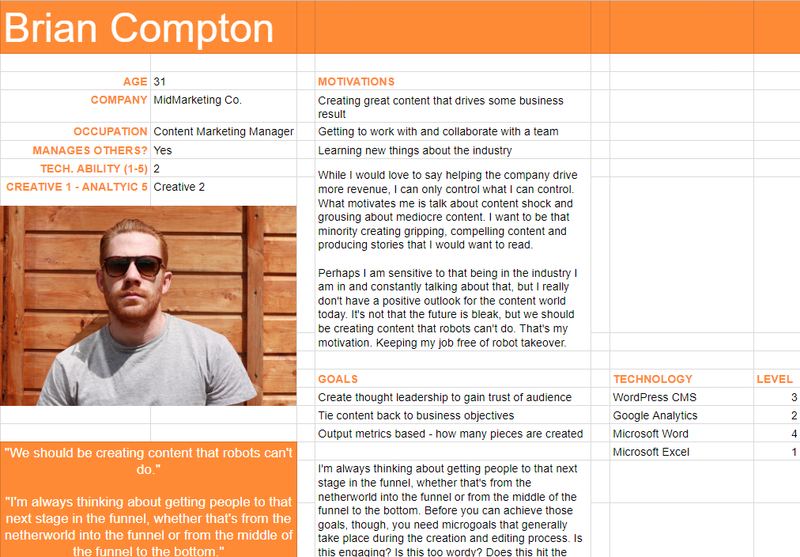 Now, we’re scrapping those buyer personas and moving to a new approach. For a long time, we have believed in and promoted the use of buyer personas in marketing, especially in the creation of content strategies. In fact, it’s a part of our “Define Your Audience” step in the seven steps we use to create content strategies for our clients. 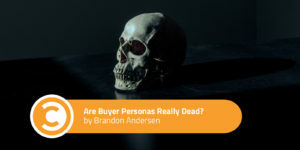 But we’ve noticed the time we spend updating and modifying buyer personas to keep up with new intelligence far outweighs the time we’ve been able to use the buyer persona itself to create content. So why spend time updating something that we seldom use? Have you also found yourself wondering why should you bother with buyer personas? At Social Fresh 2017, Christopher Barger of Brain+Trust Partners suggested that trying to categorize your audience into very specific buckets is simply not relevant anymore. How they interact with your content. How they interact with your competitors’ content. Where they get their news. What topics truly resonate with them. How those topics drive them to action. The channels that get them to engage with you. And most importantly, their pain points. While personas can be a good starting point, they are often based on assumptions and are overly broad. Even personas we round out with data still assume that everyone in a certain category has the same needs and pain points. We need to move from assuming what a category of people wants to knowing what point points individuals have. At Ceralytics, our four buyer personas are all within the marketing field. However, we’ve had real clients who are CEOs, COOs, and heads of business development. We don’t have buyer personas for these people, so should we create them? We debated it. After all, we’ve proven that these people are our audience; they’ve been on calls with us, asking questions and seeking solutions to problems they had. But their titles really had nothing to do with their need. What they all had in common were pain points: lack of clarity around how to position their brand and what content they should use to communicate with their audiences, both in terms of marketing and sales. After some deliberation, we opted not to create buyer personas for these people, but rather take their pain points and add them to a faceless persona with no title. Then, we found that a lot of our clients and prospects fit that faceless persona. When we just looked at the pain points and stripped away a lot of the other demographic information—age, gender, title, company size, etc.—it made things even clearer to us. What mattered were the pain points and how we, as a company, address them. With all of the tracking we can do on buyer’s journeys, we don’t have to put people into user personas artificially anymore. People put themselves into their own buckets. This self-identification through a buyer’s own actions gives us a much clearer picture of their true pain points. If someone visits your site via organic search, reads three articles about how to smoke the best pulled pork, then two weeks later buys a smoker from you, do you try to bucket that person by demographics? Or do you look at the topics that resonated best with them and their buyer journey? In this case, it doesn’t matter if the person was 18 or 80, black or white, rich or just getting by. What mattered was what they did and how they engaged with what you created. New technologies, including natural language processing and predictive analytics, identify the pain points our audiences have, track how they navigate a site by topic instead of by page, and deliver us insights in near real-time. In a post-user persona world, technology takes us from guessing to knowing. Social intelligence gives marketers a deeper understanding of the wants and needs of their audiences in near real-time. Content intelligence uncovers current gaps in addressing pain points that other companies in your space are exploiting. It also identifies potential audience pain points that are currently underserved in your specific industry. Content intelligence also uncovers the topics that attract people to your site, engage them, and get them to convert. The result gives you a deeper understanding of what your audience truly needs to move from an inquisitive prospect to a buyer. And it’s based on real data, not assumptions. Marketing automation systems (MAS) and customer relationship management (CRM) tools also play an essential role in the post-user persona world. These databases of prospect and client information, when combined with content and social intelligence, bring a level of context and personalization buyers will come to expect. On the contrary, all of this data will only make marketing more exciting. You’ll be able to go all-in on creative projects with surefire evidence that you’re solving the right problem for the right people, thus delivering real value to your audience and driving business results. Confidence from that smarter starting point will lead to greater creativity, happier audiences, and better business results. How Do You Create Content and Products Without Buyer Personas? As technology advances and more data becomes readily available, everyone will find their own way of creating granular content that is personalized to the individual. Some will utilize CRM and marketing automation systems to personalize content for individuals on each of their site visits, creating a predictive path for each user. Amazon is a good example of this, though they are far from perfect. What is the pain point we want to solve with a communication or product? What feeling do we want people to have as a result of the communication or product? The pain points come directly out of our content intelligence. We know what pain points resonate with our audiences across our site and our competitors’ sites. We know which pain points drive people to our site and which pain points lead them to take a buying action through our conversion analysis. The feeling we want to instill in others, the one in that second bullet point, comes from the core of our brand. Speaking with a different voice to every demographic doesn’t feel genuine. Instead, we speak with one voice to that pain point, whether the person with that pain point is 18 or 80. That authentic voice should come from the core of your company as well. Why does your company do what it does? As best selling author and marketing consultant Simon Sinek would say, “What is your why?” Be true to that mission. Be true to your company’s voice. Don’t placate your audience. Identify the real pain points your audience has, and then speak with your voice to solve them. That’s far more valuable than any buyer persona.